One of Italy’s most charming regions is Le Marche, which sits on the Adriatic Sea south of Bologna. In its Monti Sibillini National Park, the Lake Fiastra reservoir is a popular tourist destination where visitors enjoy swimming and participating in fishing competitions. Esri Italia deployed four SENDAS sensors around Lake Fiastra during its collaboration with Italy's National Institute of Geophysics and Volcanology. Since 1940, however, evidence of deep-seated gravitational slope deformation has been observed in the surrounding Apennine Mountains. These movements, which are caused by active faults and the area’s tectonic setting, occur over larger areas compared to landslides. They are the source of the many trenches and deep-ground creeps (gradual, downward movements of soil) that endanger hikers. To monitor these ground deformations, Italy’s National Institute of Geophysics and Volcanology is experimenting with an innovative solution. Developed by Esri Italia, it uses GIS and single-frequency, lightweight Global Navigation Satellite System (GNSS) sensors to detect possible anomalous movements in the mountains and identify potential areas of impact. 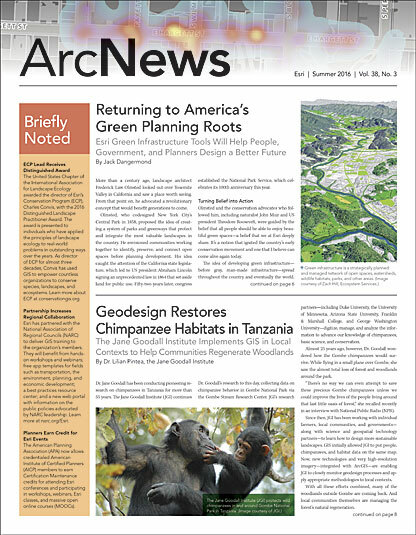 Using GNSS to measure slow ground displacements is a well-established practice. However, the typical available solutions are based on expensive, bulky, and energy-demanding geodetic-class GPS receivers because, until recently, these were the only ones able to meet the accuracy and precision requirements demanded by high-end apps. This factor alone limited the use of GNSS monitoring systems. Recently, though, developments in signal analysis and advances in technology have brought to market compact, single-frequency receivers that have extended applications in the field compared to what they were originally intended for. The simultaneous miniaturization of the devices and advances in wireless data transmission technology have given way to solutions that reliably manage and transmit data, even in areas that require simple infrastructure. Moreover, the development of new navigation satellite systems around the world, such as Europe’s Galileo and China’s BeiDou, will soon ensure that measurements can be repeated, even for low-end, compact sensors—a fundamental element for monitoring slow, nonlinear drifts that are potential precursors of structural terrain failure. In late 2015, after Esri Italia carried out two years of research and development in collaboration with SpaceEXE, an Italian startup that specializes in designing microelectronic devices, a new and innovative solution for monitoring ground deformations was released: the SurfacE Network Deformation Monitoring System, or SENDAS. 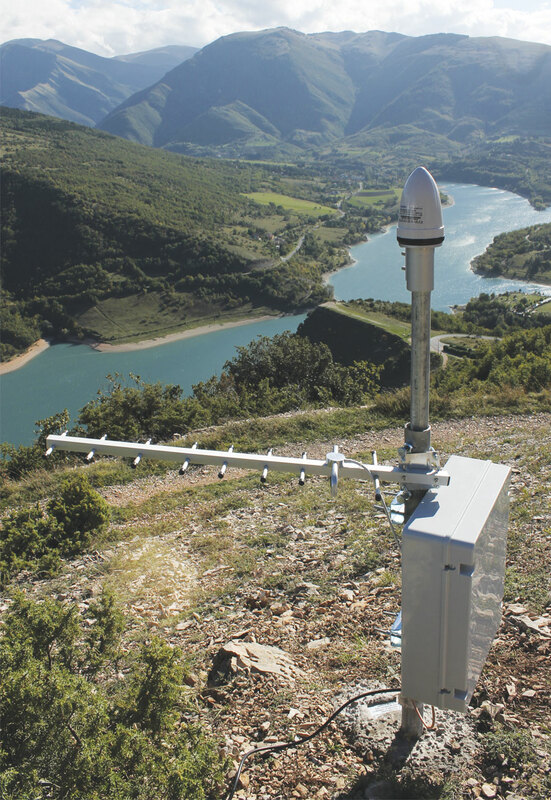 This system collects GNSS data via local receivers, which transmit the information to a local gateway. A modem then sends the data in real time to a cloud server, where it is processed for a variety of uses. The dashboard lets end users see near real-time information on sensors' battery charges, solar panel voltage, and the quality of the wireless interface being used to transmit and process data. SENDAS sensors are composed of a single-frequency GNSS receiver (that works with both GPS and Galileo) and an antenna, a power supply based on a photovoltaic panel, and an 868 Megahertz (MHz) wireless interface that transmits GNSS and telemetry data. The sensors form a mesh network, which is capable of delivering the data to a gateway node equipped with a General Packet Radio Service (GPRS) modem. This mesh topology provides a reliable infrastructure in case individual nodes malfunction. Data is transmitted, stored, and processed regularly on one of the National Institute of Geophysics and Volcanology’s servers using NDA, a software entirely developed by Esri Italia. The software works best with single-frequency receivers that form local area networks with baseline lengths (the distance between a base station and a rover) of up to 10 kilometers. To monitor small shifts in land, the server automatically updates historic displacements of each point with millimeter-level repeatability, or precision, and lets users select update periods of one to 24 hours. For a half-day measurement session, the system can typically detect displacements of just a few millimeters. 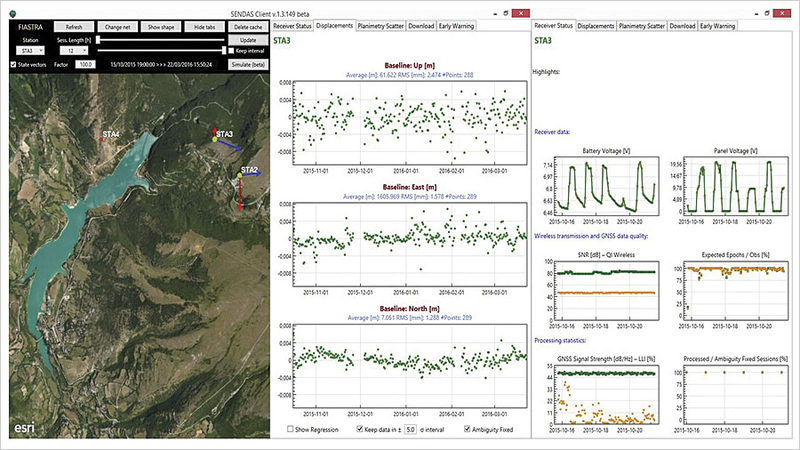 Using a dashboard, end users at the National Institute of Geophysics and Volcanology or with the National Institute of Oceanography and Experimental Geophysics can check the field sensors’ telemetry, as well as other information, such as the efficiency of wireless data transmission and the GNSS data quality. If there are malfunctions in the system, or if the land’s deformation rate exceeds a preset threshold, the dashboard sends warning emails to those at the institute who are responsible for preventing potentially catastrophic events. Esri Italia also built an app using ArcGIS Runtime SDK 10.2.6 for the Microsoft .NET Framework that allows users to overlay shapes onto the area being monitored in an effort to detect trends in transpiring deformations. The app allows users to model the potential effects of deep-seated gravitational slope deformations. Users can plot current ground strain vectors on a geomorphological map to identify and prioritize possible environmental and man-made threats. They can also intersect potential areas of impact with at-risk elements, such as buildings, roads, power lines, and vulnerable populations. Users can categorize the level of danger the hazard presents based on the demographic and infrastructural factors of at-risk areas. And they can use the app to develop effective hazard response plans, such as evacuation routes and containment strategies. Around Lake Fiastra, “SENDAS is used by [the National Institute of Geophysics and Volcanology] to [monitor]movements induced by a deep-seated gravitational slope deformation causing sinkholes in the ground, often tens of meters deep,” said Massimiliano Chersich, the Esri Italia GNSS solutions manager. Esri Italia has deployed four SENDAS sensors around the lake to constantly keep track of very small land shifts. This allows the institute to react before any sinkholes form—closing trails or roads to protect the national park’s visitors. SENDAS is also being used in other localities around Italy. In February, for example, it helped local authorities in the small northern Italian town of Cazzaso close a road that leads to a neighboring village to keep citizens safe from a known landslide that was showing elevated movement. With this unique tool, the National Institute of Geophysics and Volcanology is improving the effectiveness of initiatives dedicated to protecting the population and infrastructure from unpreventable movements in land. In turn, that is helping preserve the unique geography—and conserve the land—that has contributed to making Italy so famous.